How did you first learn about post-graduate service? I learned about the Peace Corps in High School. I thought it sounded like an amazing opportunity to give a year or two of your life to others. Eventually I decided I wanted to do some type of service related to my Catholic faith. Serving for an extended amount of time was something I felt called to do for a long time. 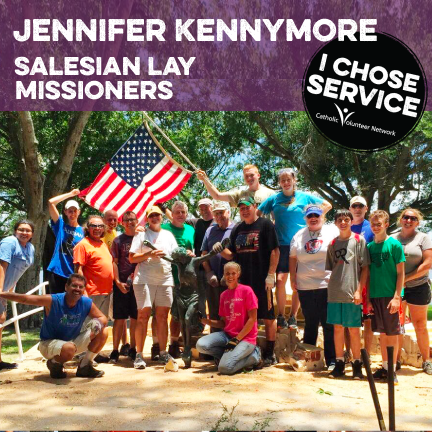 What other options were available to you, and why did you decide on Salesian Lay Missioners?For health reasons the Peace Corps was not an option for me but I still wanted to serve. I had applied to the Salesians when I graduated with my MPH but decided to postpone my year of service. Options at the time I joined were to stay at my current job, start a different job or do mission work. Tell us about your service experience. Originally I wanted to go abroad but I knew my skills and experience would fit well with the needs in Tampa. It worked out for the best and I am so happy to be a part of the Salesian family now! My role in Tampa included being registrar at summer camp, tutoring at the boys and girls club, event coordination, retreat facilitation, socializing and helping retired Salesian priests and brothers, and more. What benefits have you gained from this experience that you might not have received otherwise? For me the biggest benefits came in spiritual growth. Being surrounded by others with the same faith and stronger faith than my own had a significant positive impact. Without my time in mission I would not have known how amazing and vast the Salesian community is. I also wouldn’t have known how much work and love it takes to make a place like Mary Help feel like a home to all who visit. I learned what I (along with the support and help from a wonderful team) am truly capable of while I was on mission and that will have positive repercussions on my life for years to come. What advice do you have for someone considering post-graduate service? Do it and do it now! I waited and it made it harder in some ways but nonetheless do it! It will be challenging and it won’t be perfect but your efforts and time will be appreciated. Also, you will make connections and and memories that last long after your time of service. Those connections and memories will last longer than a year’s salary and after your year (or two) of service you will know in your heart that you had an impact and made a true difference in the lives of others.